Set into a double sided panel, each with hand scribed indices, the spine tooled in gilt and inscribed 'PAOLETTI 5, OPERE MODERNE. Making casts from engraved gems, or cameos, was a common practice from ancient times, and was particularly popular among Roman connoisseurs of the 18th century. When such plaster casts became popular souvenirs for Grand Tour travelers in the early 19th century, several shops opened which specialized in them. 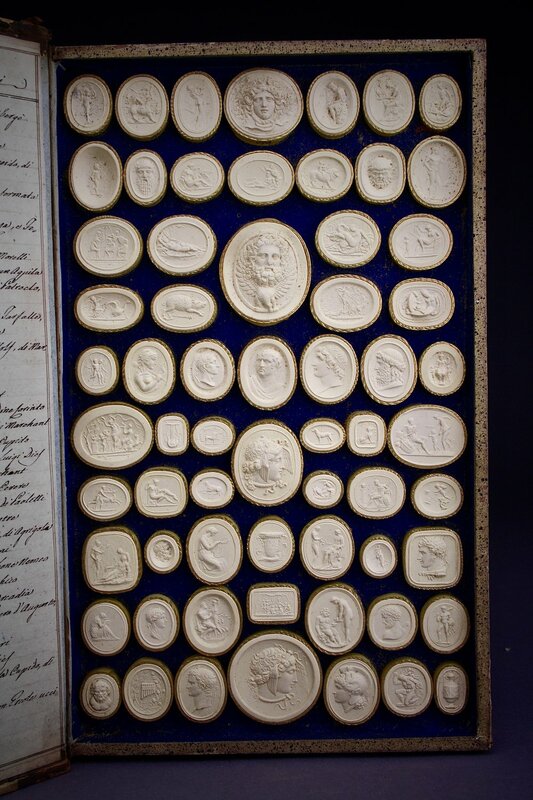 These souvenir casts not only represented carved gems, but also contemporary and ancient sculptures and monuments, and were often mounted in faux book bindings, as in the present example. The Scotsmen James and William Tassie were among the most prolific casters, as were Bartolomeo Paoletti (1757-1834) and his son, Pietro (1801-1847). The Paoletti firm advertised themselves in Count Hawks Le Grice's guide Walks though the Studii of the Sculptors at Rome (1841) as follows: Paoletti begs to inform the public that he has arranged a collection of impressions (Impronte in Scajola) of many of the works in sculpture executed by distinguished artists ... Although the Impronte are but miniature copies; yet they exhibit all the fidelity and beauty of the original, and convey to the eye a better idea of sculpted works of art than the most finished engravings. The Paolettis, whose studio was located on the Piazza di Spagna in Rome until 1847, enjoyed a stellar reputation, and counted among their clients Catherine the Great of Russia and Ferdinand III, Grand Duke of Tuscany. The firm continued to do business after the death of Pietro until at least 1865. The present example dates from the lifetime of Bartolomeo, however, as evidenced by the following inscription found in two of the volumes: Si fanno in Roma da Bartolomeo Paoletti, e Pietro figlio, dimoranti di Studio in Piazza di Spagna num˚ 49. Examples of the Paolettis' casts are conserved in the Victoria & Albert Museum, London, and the Yale Center for British Art, New Haven, Connecticut. Condition: The spine and cover heavily worn with losses in areas, with evidence of historical worm infestation. 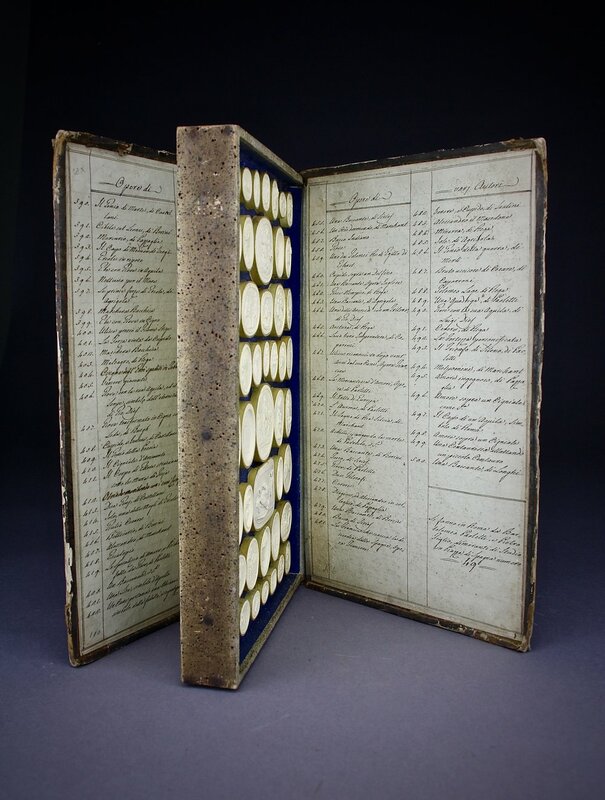 The interior intaglios and indicies in good order and complete.